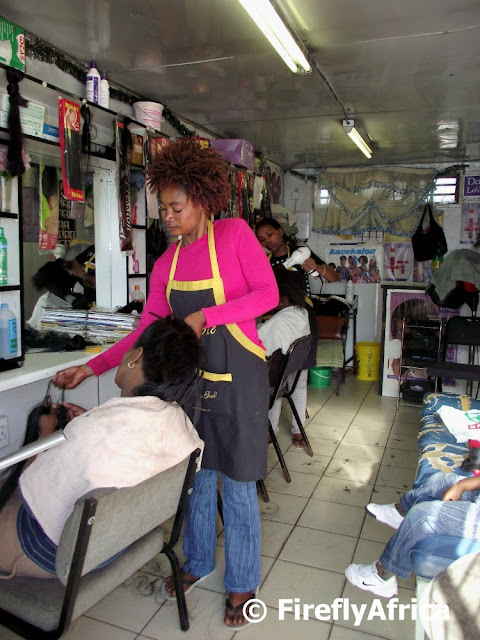 Hair salons in the township is a dime a dozen yet its apparently a very good business to be in and they all make a decent living. I took a peek into one of the containers (and with containers I really mean most of them operate from shipping containers) in New Brighton the other day and was pleasantly surprised to see how well it was kitted out. One wouldn't think its housed inside a container. The hair dresser was busy putting extensions into the customer's hair and were still going to braid her hair later on. Good to be back and catch up - had a good browse through the blog. We have been away in Botswana and have been a bit frantic with deadlines. Lovely photos as ever. This blog is providing 100% fact information regarding hair salons is the best business. I agree with you.